There is no friend as loyal as a book. If book deals with the subject of spirituality, then the words have the power to transform us. DJJS in its endeavour to spread ‘World Peace’ through self-realization presented the literature “Ashutosh Maharaj Ji: Mahayogi Ka MahaRahasya” to Sh. Rajnath Singh (Home Minister, Govt. of India) and Shri Sukhbir Singh Badal (Deputy Chief Minister of Punjab). 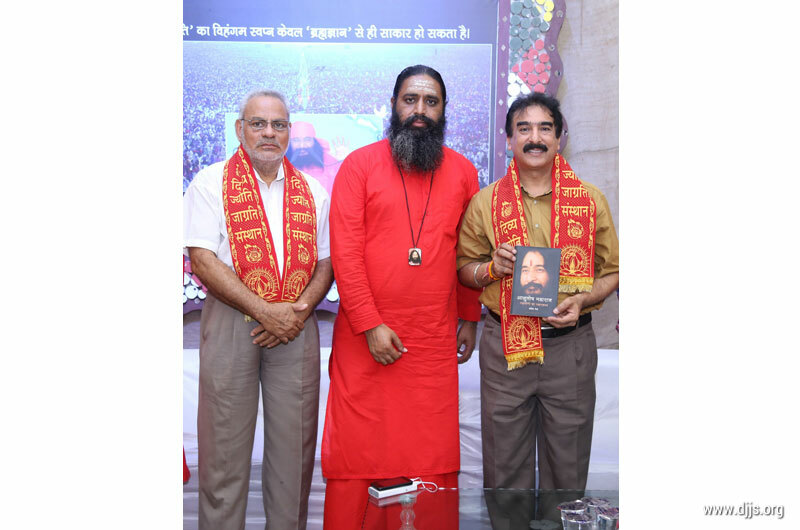 Swami Sajjnanand Ji presented this literature and explained mission and vision of DJJS to the high profile dignitaries. The preacher disciples of Shri Ashutosh Maharaj Ji (founder and Head of DJJS) discussed about the several on-going projects of the organization in both social and spiritual arena. In Ambala, Swami Prem Prakashnand Ji, Sadhvi Meenakshi Bharti Ji and Sadhvi Gopika Bharti Ji distributed and discussed the literature at length with Mrs. Neeta Khera (Member of Haryana Public Service Commission), Mrs. Banto Kataria (President of Women Wing of BJP and Wife of Mr. Ratanlal Kataria, MP) and Mr. Rameshmal Ji (Mayor of Ambala). A similar initiative was undertaken in Jalandhar where discussions took place with people across different spheres of life. Swami Umeshanand Ji and Swami Ashokanand Ji had interactions with dignitaries like Mr. Vijay Sapla (Minister of State for Social Justice and Environment & MP from Hoshiarpur), Raghunath Rana (Chairman, Punjab Mall Scale Industry), Mahinder Bhagat (Senior BJP Leader & Industrialist), Manjit Bali (S C Morcha, Punjab Pradhan), Jyoti Noora & Sultana Noora (Famous Bollywood Singer), Dr. Om Gauri Datt Sharma (Director, Jalandhar Doordarshan), Padamshri Hans Raj Hans (Famous Sufi Singer), Gurbinder Singh Atwal (former Congress MLA), Sunil Sehgal (Dharam Jagran Samanvay Vibhag, Pb. Sanskriti Pramukh RSS, Akhil Bhartiya Member RSS), Nirmal Sidhu(Famous Punjabi Singer), Rashim Mahajan (Owner of Modern Surgical House Industry), Vicky Tulsi (Senior Akali Dal Leader) and Ninja (Famous Punjabi Singer).